As a huge fan of some classic side-scrollers, like Teenage Mutant Ninja Turtles: Turtles in Time and Super Mario World, it’s hard to imagine the many similarities within Bleed 2. Though I haven’t played the original, the sequel looked too nostalgic to pass up. And I’ll tell you right now, Bleed 2 is not only fun, but also entirely chaotic at the best, and worst, of times. I came into Bleed 2 completely fresh, with no knowledge or skills from the original game, however, fortunately, that seemed to work in my favor. Bleed 2 is a simple tale where the protagonist, Wyrn, is playing video games in her room when all of sudden she’s interrupted by the evil chaos in the world. At that very moment, she knows of her duty, as the hero of the game, to stop it. Sure there isn’t much of a story here, other than fighting the big bads to save the world, but it’s not lacking without it. With the fast-paced action of this 2D side-scroller, it’s hard to imagine a good story would even have a place here. What pulls you in instead is the gravity-defying action that takes place in a large variety of environments, from streets and cars to ships and literal flying rockets. The story mode offers up seven different levels, and though the game is short overall, ending somewhere between one and two hours, there is plenty of fun packed into it. Bleed 2 brings the abnormal to the forefront, offering up boss battles as a regular occurrence. And, if you’re lucky enough to make it out alive, you’ll be just as happy to delve back into the thick of it in the next level as you were relieved to beat the last. Now if you’re concerned about the side-scroller action getting boring, fret not, for at the end of every level and victorious boss battles there are comical little cutscenes. Though there may not seem to be much rhyme or reason behind the cutscenes, they do break up the action nicely. Sure, the story is where you learn the game, and where you really get a feel for how it works, however, the other three game modes are where you get to hone your skills. Plus, a few extra game modes on top of a short and sweet story mode never hurt anyone, right? Indeed, the additional game modes add a lot of replayability to an otherwise short run through. Arcade mode offers the ultimate test, giving players just one life to compete against their foes. Endless mode is exactly what it sounds like, offering up the ability to play for as long as you want on randomly generated levels, without interruptions from the cutscenes. Finally, Challenge mode offers exactly that; a chance to take your skills to the test against up to three bosses at a time! If you want chaos, this is the mode for you. Of course, if you wanted to play with a friend, there is co-op available as well, and this is just as much fun as you’d expect. Though Wyrn comes equipped with dual pistols and a katana, similar to that of Deadpool, there isn’t much else going on in the way of controls here, other than the ability to jump. 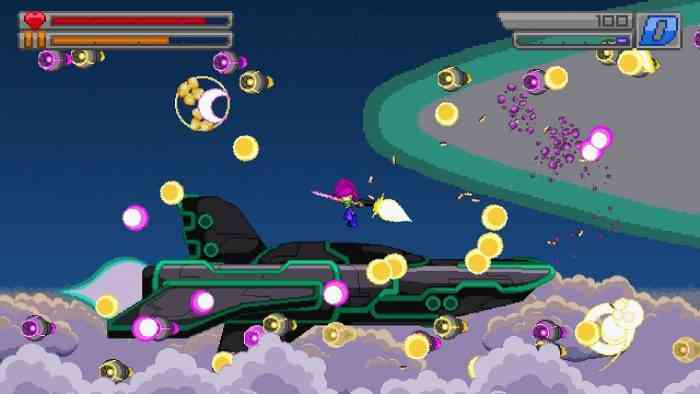 The controls are fairly straightforward, and the more you play, the easier they become. I’ll admit, however, that I had a hard time getting used to the pre-set ones. As a result, I quickly changed the main ‘dodge bullets’ and jump buttons to what I was more comfortable with. If anything this is the most important thing to do if you’re struggling with the game at the beginning. Take my word for it, or die trying to prove me wrong! Regardless, one thing that definitely isn’t an easy learning curve is the accuracy given to the shooting of the twin sticks of the controller. Tighter accuracy would make Bleed 2 that much better to play and would have definitely been appreciated against the swarms of enemies. This is, without a doubt, the most frustrating part of Bleed 2, as you try and skillfully bob and weave your way through the incoming bullet hell. So, do the graphics and game sound make up for what the controls lack? Almost. Although the graphics are a bit plain, Bleed 2 bottles up that nostalgia and disperses it throughout every environment here. As for the voice acting, it’s nothing to write home about. 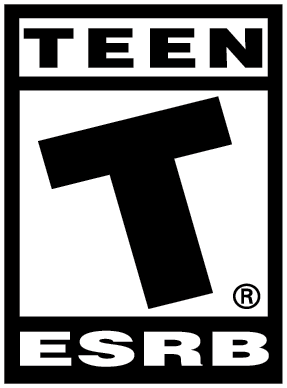 With that said, the cut scenes are humorous and add a little something extra, and the music, though repetitive, really brings the intensity of the chaos to the forefront of the game. 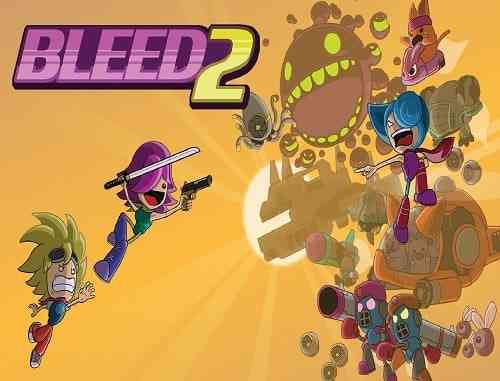 While Bleed 2 doesn’t exactly break new ground in the 2D side-scroller action-adventure genre, it stays true to the classic games it was modeled after. Despite a few small stumbles along the way, this sequel really does a lot to capture the hearts of anyone willing to try it. Bleed 2 is, quite simply put, intense fun bundled up into a small package. Whether you’re a fan of this arcade style game or you’re just looking to add something new to your library, this is definitely worth the pickup.